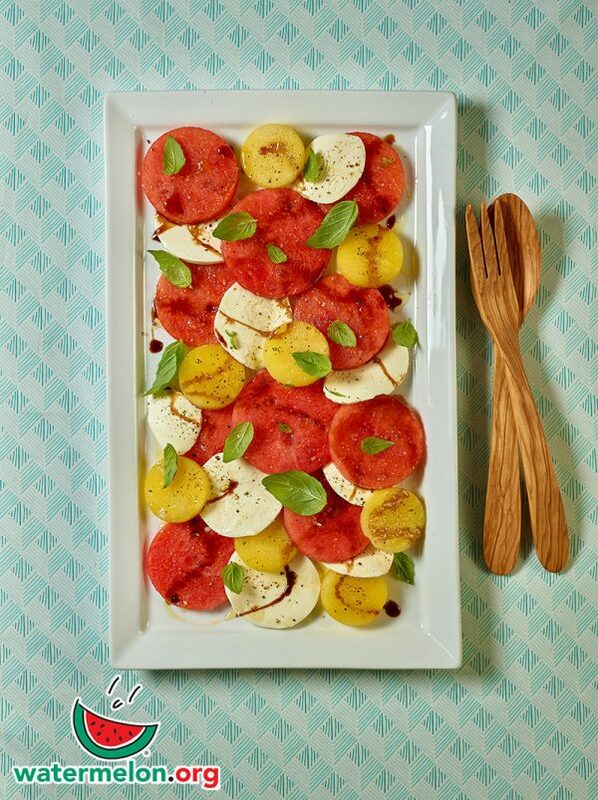 This fun twist on a classic caprese salad makes it extra refreshing with a whole new level of sweet. 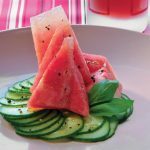 Watermelon adds crisp sweetness that is perfectly savoury with balsamic vinegar and olive oil. Place the watermelon slices on paper towels and cover with additional paper towels to absorb some of the excess fluid. In a small saucepan over medium heat, add the vinegar and honey. Stir to blend, bring to a simmer and reduce heat. Stirring occasionally until the mixture has reduced by almost half. (Do not let reduce to far or to froth). Set aside to cool slightly. 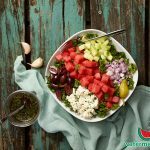 On a large platter, place the watermelon slices and top each with a slice of cheese. Salt and pepper, then sprinkle the basil leaves evenly over the top. Drizzle with the olive oil followed by the reduced balsamic vinegar. Garnish with basil.